DevOps approach to software delivery and business operations is the most efficient one out there. However, as the time goes, new trends appear and gain traction. While DevOps itself is not new and DevOps culture adoption is going on a steady pace amongst businesses of all sizes, the paradigm itself is evolving quite fast. Some new tools and practices emerge, while some lose the name of action and go out of use. Thus said, in order to remain on the pinnacle of progress, both decision-makers and IT-specialists should be aware of the latest DevOps trends and use them in their daily practices. Otherwise, the businesses risk losing the competitive edge or ultimately failing with their transition to DevOps. 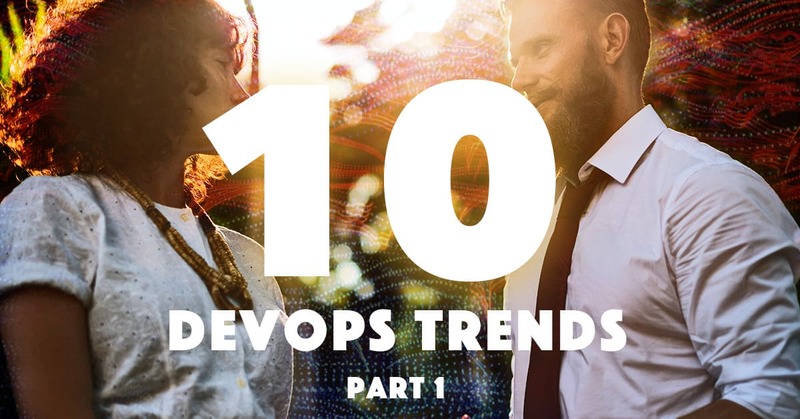 In this part of the series, we are going to depict 3 hottest DevOps trends out there. The next part will be devoted to the trends that are only gaining traction. The last part of the series will be describing the trends in DevOps services that are just emerging, yet might have a significant impact on the future of DevOps as a service and IT industry as a whole. Docker proved to be the most efficient containerization tool around. We described its immense capabilities and benefits in one of our previous articles, and as the tool matures it gains more and more widespread support across the DevOps community. Docker Compose and a host of other configuration orchestration tools like Terraform, Docker Swarm and Ansible help ease the application development and configuration management. By the way, quite recently Docker has added native support for Kubernetes out-of-the-box, making this tandem even more easy to setup and use. Therefore, instead of going for vendor-specific PaaS cloud solution for their infrastructure and development environment, the businesses are more widely adopting the use of cloud-agnostic containers. This enables the companies to build multi-cloud systems to better respond to business needs. Rapid development timeframes pose certain limitations on QA professionals, who are forced to learn to code or risk becoming expendable. Writing automated unit tests can seem a tedious and daunting task, yet being done once it saves many hundreds of hours of manual testing in the long run. When these tests can be run against any single piece of code, the bugs are spotted and resolved quite fast, greatly reducing the development time and bolstering the software development pipeline predictability. The developers should learn to test and the QA staff should learn to code in order to be able to provide automated testing that falls in line with the Continuous Integration and Continuous Delivery principles of DevOps. Skilled manual testers are still needed in the areas where automation is not available, like data warehousing and ETL solutions, yet these positions are scarce and the employers have quite a pool of candidates to choose from. The ability to provision server instances with 1 click and recreate the containers within seconds provides an unmatched degree of versatility and resilience for the infrastructure. If any issue occurs, the container can be recreated at once, the alert can be raised and sent to the specialist responsible for dealing with it, along with the logged information about the incident. If there are a couple of Kubernetes pods running simultaneously — as this actually should be — the customers will not even notice any downtime. Self-healing systems are now a reality, due to sophisticated application management tools and infrastructure provisioning solutions like Kubernetes. We have described the 3 hot DevOps trends that are spreading across the industry right now. In the upcoming posts, we will depict the emerging trends and the ones to gain traction in the future and greatly influence the evolution of DevOps as a service. Stay tuned for the updates and share your thoughts on the matter!